In which G.M. 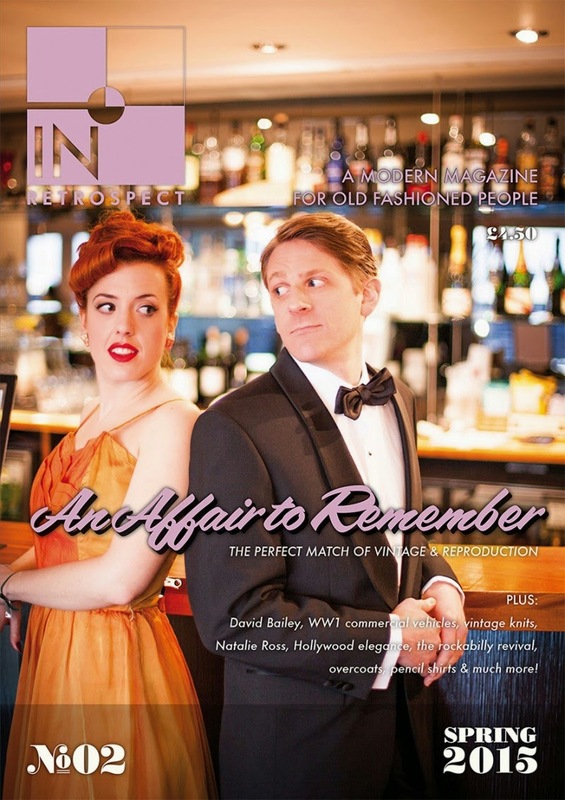 Norton urges you to get the latest copy of In Retrospect magazine. As a keen writer, I feel fortunate to have written for four published magazines to date. It all began with Pretty Nostalgic, the beautifully crafted magazine-book. Sadly, after penning three gentleman’s guides, my involvement with them seems to have reached a natural end. Then there was the short-lived His Vintage Life, the little brother of Her Vintage Life. Why they can’t just have one publication aimed at both sexes still confuses me. Featured in two out of three issues, at least they had the decency to inform me of their demise by letter. Ernest Journal arrived on the scene last year, put together by the former editor of Pretty Nostalgic. I have a soft spot for Ernest. So far, I've been fortunate to review soaps, colognes and shaving paraphernalia. My bathroom has never smelled so good. The fourth and final publication is In Retrospect, created by a vintage loving and passionate holy trinity of Mat Keller, Becca Mountfield and Alex Backhouse. Their vision made perfect sense - to produce a truly vintage publication, penned by people that are genuinely interested in vintage. In which G.M. Norton sings the praises of his super slipovers. With spring on the horizon, it will soon be time to retire my winter wardrobe that has served me so well. During the autumn and winter months, a chap of my ilk naturally reaches for the knitwear. In my case, my growing collection of Fair Isle slipovers. Not only do they offer an extra layer of warmth but they look pretty darn good too. So before they are lovingly stored away until the trees perform their customary striptease, I thought I would share them with you. I’m now the proud owner of five Fair Isle knits. The first is one you’ve already made the acquaintance of, a Darcy Clothing special, providing the perfect mix of autumnal colours. This is a very versatile little number. In which G.M. Norton recalls the scariest day of his life. Today marks a happy but poignant day for your favourite protagonist – the birth of my youngest daughter. There are three candles planted in her birthday cake this year. To look at her now, you would never guess that the day of her arrival into the world was the most harrowing experience of my life. I will never forget the moment her blue body slithered out of my beloved and into the arms of a team of nurses. No cry. No sign of life. More medics rushed into the room where they crowded round a table that my darling daughter was lying down upon. It was the longest five minutes I’ve ever experienced as they tried to resuscitate this precious baby. Our baby.